It’s… alright, I guess. I haven’t been blown away by any of the covers for the series, and the shift in tone and subject, if not style, is a little jarring, but, hey, swords and axes had little to do with Abraham’s series, anyways. Torches are cool, I guess. I’m neither here nor there on the cover. It’s okay. I have no doubt that what’s underneath will be rockin’. Abraham suggests there might still be minor changes coming, but the design is almost final. Clara Kalliam, freed by having fallen from grace, remakes herself as a “loyal traitor” and starts building an underground resistance movement that seeks to undermine Geder through those closest to him. Cithrin bel Sarcour is apprenticing in a city that’s taken over by Antea, and uses her status as Geder’s one-time lover to cover up an underground railroad smuggling refugees to safety. And Marcus Wester and Master Kit race against time and Geder Palliako’s soldiers in an attempt to awaken a force that could change the fate of the world. 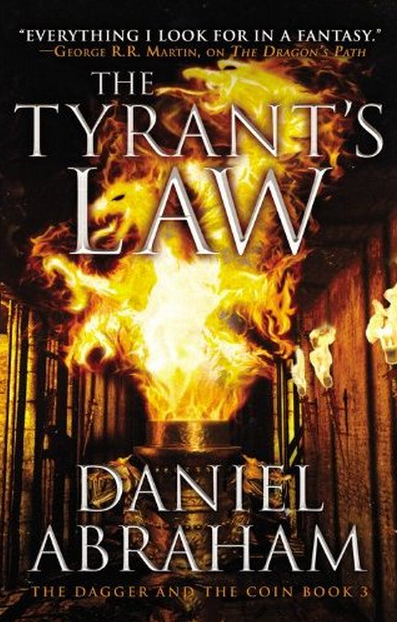 The Tyrant’s Law is set for a May, 2013 release, and I’m already salivating. I can’t wait for this! I was really taken in by the first book. I regret to say that I keep getting distracted by other things and have yet to read the second book — must change that soon. But even if by some fluke I haven’t managed to read it by the time this one hits he shelves, I’ll end up buying a copy for myself anyway! I’m always bemused and befuddled by people who even THINK about the cover to a book when discussing that book’s merits. I really don’t care what the cover looks like, I just want to read the next book by Daniel Abraham! Is it the last book in “The Dagger and the Coin” books?I thought Tyrant’s Law was probably the best of the three actually.